Designed to look like an old-school pub Poker machine, Astronomical nevertheless has some up to date graphics, features and images across its three reels, while the ease of play and straightforward layout will attract those who remember these games from years ago, and those who just want lots of winning spins. Astronomical has been developed by Microgaming, which is one of the most prolific producers of online casino games and has supplied many of the biggest sites for a number of years. Their enviable reputation for fair play and reliability means that anyone at this game can be assured that they will get a fair return overall, or maybe even one of the nice 8000 coin maximum jackpot wins. This type of game is pretty much as simple as it gets, so anyone looking for flashy animations, lots of bonus rounds and so on would perhaps be better off playing one of the newer style Microgaming pokies, but for a relaxing session just spinning away and waiting for winning combinations to appear, this could be a good place to spend some time. The layout consists of three reels and a single payline, with a useful paytable alongside to let the players know what prizes to expect when lining up a winning combination. The background image is the main feature that gives Astronomical its own distinctive style, with lots of stars and the games name presented in a suitably retro font , but don’t get too excited as that’s about it for the outer space theme. Getting started is as easy as it looks, with players only needing to select coin sizes, and the number of them to wager with, but they need to bear in mind that only by playing the maximum of 3 coins will they win the biggest jackpots. Coin values can be 0.25, 0.50, 1.00, 2.00 or 5.00, and to maximise the wins, these amounts should be tripled to give a wager per spin of between 0.75 and 15.00. Symbols are mostly standard stuff that can be seen on a zillion other pokies, namely cherries and single, double or triple bars, which pay out some of the more modest wins in their various guises. A single cherry is enough to bring in 3 coins at maximum bet, while landing 3 of the triple bar symbols at maximum bet rewards payers with 300 coins. 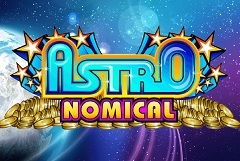 All very normal so far, but there are a couple of unique symbols that make Astronomical a little more interesting, starting off with the planet icon which has a value of 300, 600, or 900 coins depending on how many coins are being played. Most interesting of all though is the Astronomical logo symbol which acts as a wild, and also spins up the biggest payouts. Unlike many wild symbols however, this one also pays out a nice multiplier, so if a single Astronomical logo substitutes for any other symbol to complete a winning line, the value of the payout is doubled, but if two of them are on the line then the win is quadrupled in value. On to that jackpot prize, and anyone lining up a full line of three Astronomical symbols will be rewarded with 2,000, 4,000 or 8,000 coins, which again is depending on how many coins are staked per spin. At the maximum coin value of 5.00, that’s a potential 40,000.00 added to the bankroll of anyone fortunate enough to be playing at that level. Classic 3-reelers have an enduring appeal and anyone who likes them will be more than satisfied by Astronomical. Clear and simple gameplay, with a couple of extra features thrown in for good measure makes this a good crossover between the fruit machines of old and the more modern type of video pokie. As an extra incentive to play this game, the very fact that it comes from such a well-known developer means that lots of care and resources have gone into making it meet the demands of online casino players worldwide.